Cambodians slather freshly cooked corn with a sweet & salty sauce, eating it as a street food, not at home or as part of a meal. Prepare charcoal grill or preheat an ungreased cast-iron skillet over medium heat. Very lightly brush the corn with oil and set on the grill rack or in the skillet. Cook, turning every 2-3 minutes, until the kernels are tender and nicely charred, 12-15 minutes total; keep warm. Meanwhile, in a bowl stir together the fish sauce, water, sugar and salt until it is dissolved. Heat the 2 tbsp oil in a saucepan over medium heat until very hot but not smoking. Carefully pour liquid mixture in (it may sputter a bit so watch out); add the green onions and simmer until the sauce begins to thicken, about 30 seconds; remove from heat and cool. 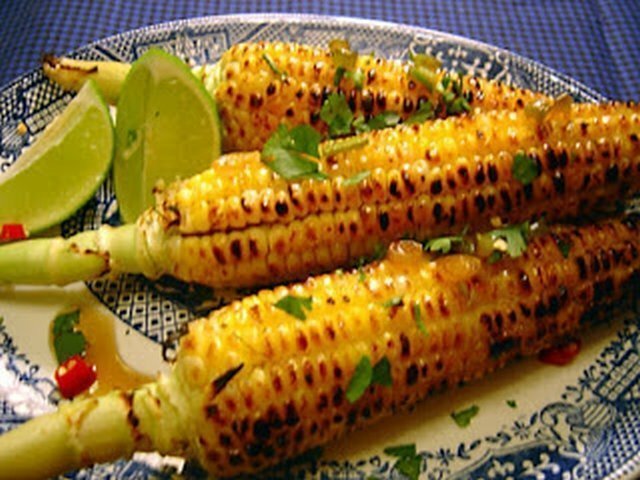 Brush cooked corn with the sauce and serve.